Inventory We are a resale marketplace, not a box office or venue. Ticket prices may exceed face value. This site is not owned by Accesso Showare Center . 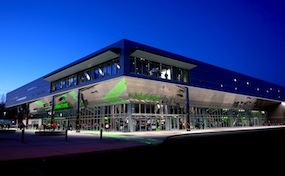 The Accesso Showare Center, formerely the Showare Center, is the new home to the Western Hockey League's Seattle Thunderbirds. The arena opened in 2009 at a construction cost of $84.5 million and has a maximum seating capacity of 7,600. The Accesso Showare Center box office is located at 625 West James Street in Kent, Washington. Also known as the Kent Events Center during production the arena is now operated by SMG. Accesso Showare Center tickets are proud to present popular concert attractions like Florida Georgia Line. AccessoShoWare.CenterKent.com is an independently owned and operated company that concentrates in the online retail of all events in the secondary ticket market. We are not currently affiliated with any official website, box office, or supplier. Prices of tickets on our site may fluctuate with demand above and below face value. To order tickets for all Accesso Showare Center Kent events please complete the steps online through the checkout.